Today’s mercantile, competitive market has also promoted a very linear train of thought: if it’s cheap, it lacks quality. Filled with cynicism, we’ve also concluded that if something is free, than it’s a trap. I mean, there has to be a hidden catch somewhere, right? Nothing in life is free. Everyone pays the ferryman, one way or another. Revolving around physical possessions as a way to evaluate someone’s worth has also made us, as a society, to believe that if something is expensive than it’s automatically a good, quality item. In turn, we will avoid cheap products because it damages our image if we are associated with them. This behavior also applies to the way we treat computer software. The worth of a trial version tells more about the software developer than it does about the application itself. A professional, reliable company will never offer a product that is quality-impaired or in any way meant to deceive or trick its customers. 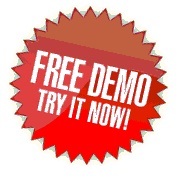 It will never release a demo, trial version of a product that is anything less or more than a first-hand experience for the client with that item. A demo software should give the client an opportunity to interact with the product, to see its uses as well as its shortcomings and its main purpose should not be to convince him that he should make the purchase. It should simply act as a showcasing for the product, a magnifying glass, all the better to analyze the full product with. Purchase options should be available, of course, as this can serve the client’s interests, if he finds the product to be worthy. Ease of access for purchase is, after all, just another service you and your company deliver to the client. What it should not be is aggressive, “in your face” and a pestering nuisance. Marketing, advertising and exposure for different products should also be present, as long as they are meant to help the client, by presenting other options to their search. It should not be designed as a way for the company to sell one more item and make another buck. An excellent place to position any sort of marketing is the “About” section. A company’s products are its accomplishments, the most sincere and objective way to describe the company and it gives a potential client the opportunity to truly learn something about you, as a business, and understand who they are dealing with. The bottom line is that the demo software needs to be rescued. It is an invaluable tool for the client that enables him to gauge the usefulness of your software and to evaluate as to what degree it will serve his needs. Freeware is just as useful for the marketing and sales department, but unfortunately, at the moment, this tool is dull and lacks its former, razor sharp edge. Companies need to recognize the value of trial versions and understand their immense potential, and the importance of their resurrection. To achieve this they would need to put the client’s needs first and their own sales second. Unfortunately, today, not many companies are willing to make investments that don’t pay off immediately or to dedicate themselves to long term partnerships and are contended just with riding a market trend and making a quick buck. This entry was posted in Articles and tagged demo, free demo, freeware, malware, software application, software manager, virus by Florian Totu. Bookmark the permalink.